If you only need the object in the photo and not its background, we usually turn our head to Photoshop. But guess what, you don’t always have to rely on Photoshop. Turns out, your smartphone with right apps, can help you cut of background from the photos as long as you don’t need pixel-perfect control. While there are a plethora of background removal apps on the Play Store; some of the most popular ones are filled with ads. 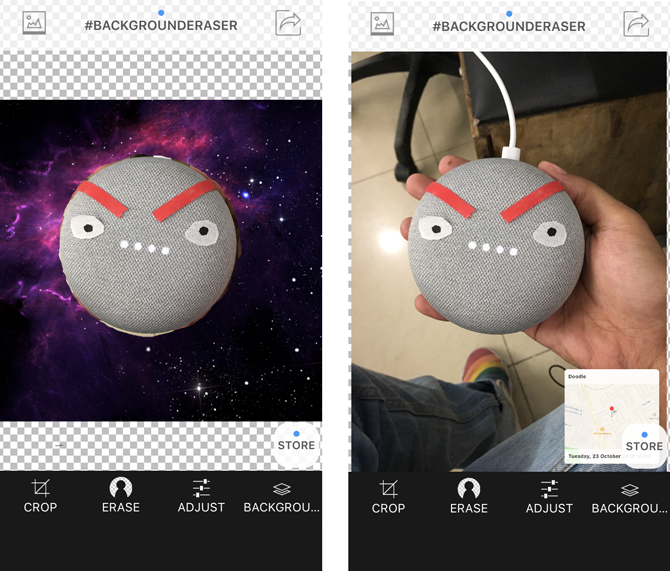 So, I hunted the App Store to find the best background eraser apps for Android and iOS (with minimal ads) and here are my findings. 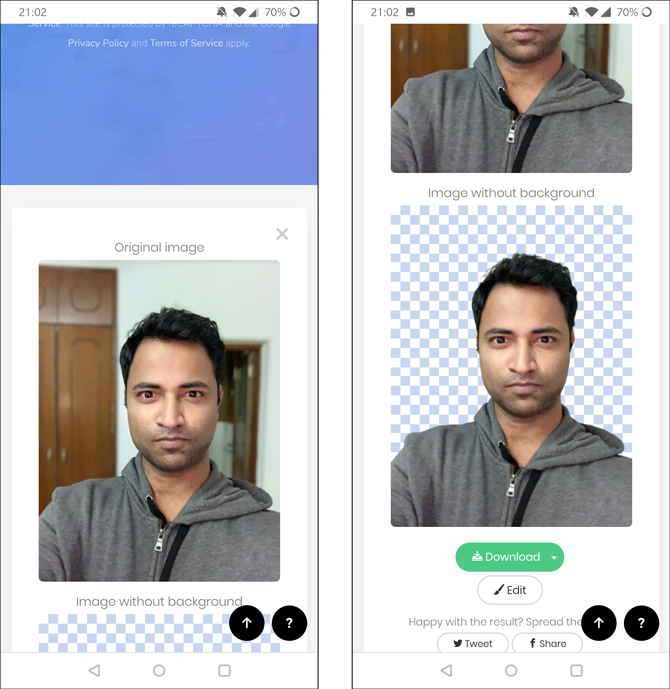 Though, you should not expect Photoshop-like results from these Android apps like cutting out fine hair or tea leaves. 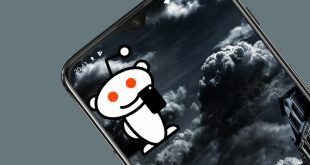 We notice these Android apps work best when the images had a monochrome background like black or red and with good contrast between the foreground and background. And yes, you can export images as transparent png. 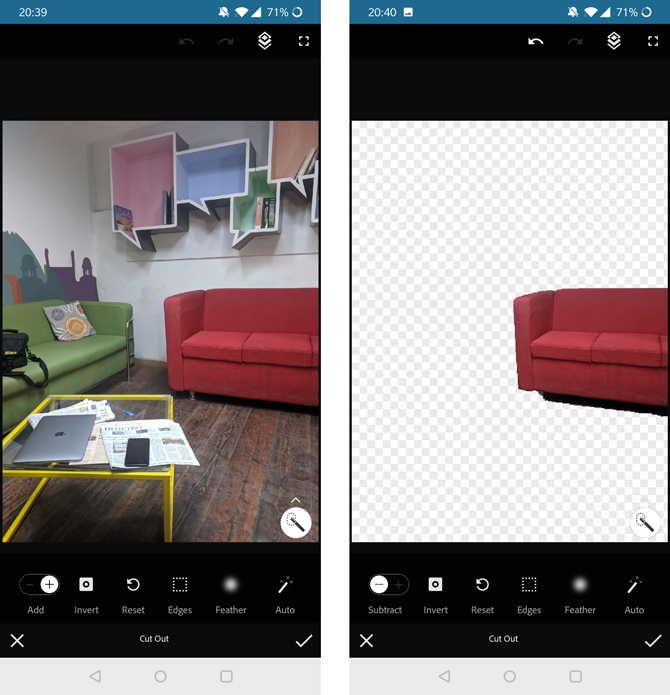 Just as you do in Photoshop on the Computer, you need to trace the area you want to extract with the highlight tool present in the app and tap the delete button. Yes, it’s that simple. You can also remove the original background and swap it with something cooler like a beach, Leaning Tower of Pisa or the Taj Mahal. Sounds fun? Well, then let’s begin. There is no dearth of background eraser apps on the Play Store, and more often than not, they are identical save for some UI changes here and there. Ultimately Background Eraser made the list because apart from the usual bells and whistles like auto mode (Magic), manual, crop, undo, offset, and zoom feature that we saw above, it has one little trick up its sleeve. You see, mobile phones have small screens and when you are working with your fingers, it is difficult to see where you are pressing, especially when you have large hands. To counter this problem, the app will show a magnifying glass every time you press the screen. It is like a zoom but only works in a particular area where you are pressing your finger. This works for both manual and auto mode. It can add text and emojis to help speak what is on your mind. You can save the image in PNG or JPEG after you have added a new background. You can also add text and emoji after making the edit. The app provides a better user experience and makes editing images easier and even fun. The app is free and ad-supported. When you install the app, it will be called Eraser and not Background Eraser and Remover. Anyways, opening the app will present you a familiar UI, if you have previous experience with any background eraser app. There is a restore button which will restore the image back to the way it was, originally. There is an undo button which only works 10 steps backward. Any changes made before that cannot be undone. When you save the image, you get an additional option to save it in PNG or JPEG format. 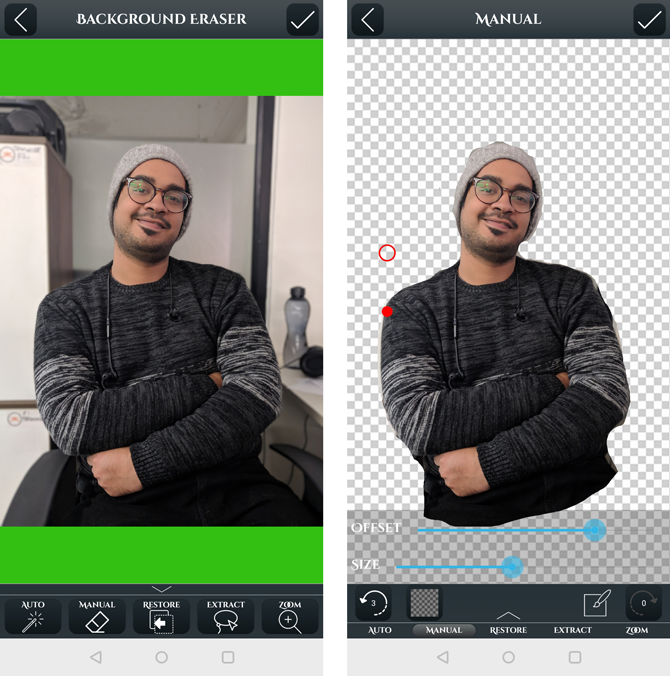 You cannot superimpose the edited image or in other words, cannot add a new background which kind of defeats the purpose of erasing the background. Once again, you will have to import the image into a new app. The app is neat and ad-supported. The accuracy level is still not where it should be when it comes to the auto mode, and you cannot superimpose or change the background to something else. There are often times when you don’t actually want to remove the whole background, just a part of it. There can be a lampost, wires or anything that doesn’t belong in the picture. Touch Retouch is a great app which removes background objects with minimal effort. You can simply upload an image and tap on the line remover to erase wires from the image. It also lets you remove objects and you can use a brush tool or lasso to select the object. You can perform quick repairs and remove blemishes from the picture with the app. The app is available for Android and iOS for $2. I know Photoshop isn’t everyone’s cup of tea and Adobe knows that. 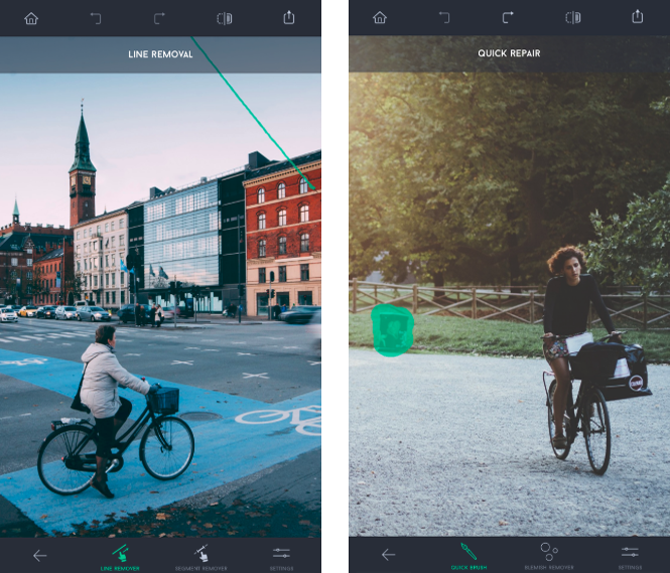 Photoshop Mix is a simple app which lets you do basic editing on your phone. You can crop pictures, adjust colors, change exposure, and add filters. It also lets you remove the background from a picture without much hassle. You can crop out a portion from the picture and blend it with another. The app offers two tools, a basic selection tool, and a smart selection tool. You can just swipe the Smart Selection tool across the area you want to be erased and the app automatically removes everything. If the app makes an error, you can simply, invert the tool action and restore the erased part. It is really simple. Photoshop Mix requires a login account which you can create fairly easily. The app is free. I’ll admit Remove.bg is not a native app but it works great on mobile. It is a web app which erases the background automatically. I’m not even exaggerating, just upload the file and download the cutout. It’s really that simple. It doesn’t even ask for an email address and it’s completely free. It has one small caveat, it can only generate cutouts of people. You can’t use it to remove the background of any other subject. If you want to quickly erase the background of the picture with a person, Remove.bg is great. This iOS app is an easy way to create cutout images. It has a simple interface, easy to use tools and a couple of editing options which are just cherry on the cake. You can crop to make background removal easier and adjust brightness, contrast, exposure, temperature etc. The erase tool has an offset which makes it easier to remove the background on the phone. Even If you make mistakes, you can use the restore brush to restore the erased portion. You can target a specific area or color to speed up the process. After you’ve removed the background, you can add a different background from your local album or select one of the backgrounds in the app. It has a collection of solid and gradient color backgrounds, plus a few space-themed backgrounds. You can save the file as JPEG or PNG on your camera roll or share it on other social media. 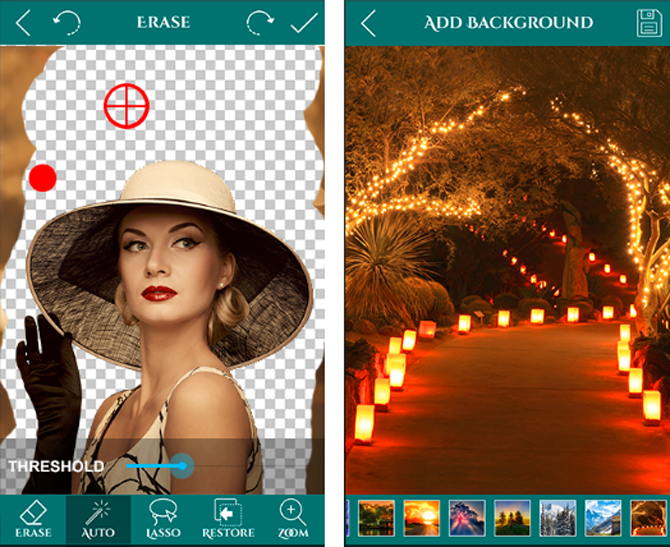 Photo Layer is a sophisticated app designed to erase the background of an image easily. The app gives you a quick tour of how to use the app and makes it easier to use its tools. It has auto, magic and manual tools to erase the background, you can use all three tools to make the process easier. The auto tool erases all the neighboring pixels with the same color palette, it’d come in handy while erasing large chunks of solid color areas. The Magic tool is a more refined version of the Auto tool, it identifies the edges and you can use it to erase the edge area of the subject. The manual tool can be used for finer adjustments and repairs. 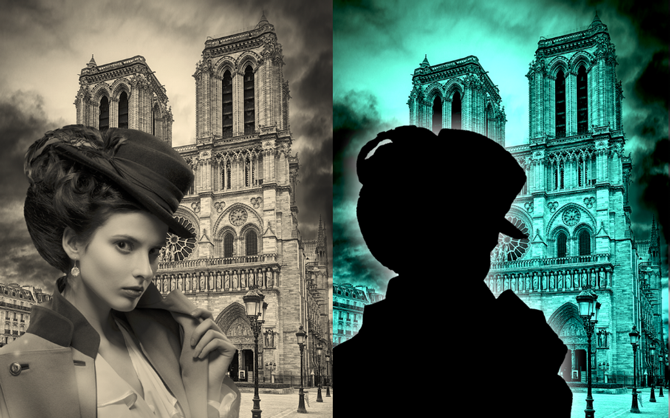 After the adjustment, you can smooth out any rough edges created during background removal to make the image softer. You can then save the image to the Camera Roll and share it to your Social Media directly. The app has ads. After using some of these apps, it is easy to get confused about which one to use. This is why I wrote this post. I like Ultimate Background Eraser because apart from the usual features, its zoom features really help when working with the image. The second best background eraser app is Change Photo Background. 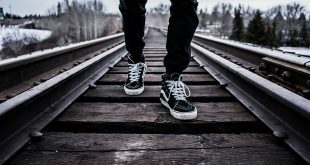 Tell me which app are you using and how it is better than the ones I have reviewed here.